For the study of food chains and food webs in general, the Southern Ocean makes an excellent case-study: the feeding relationships are relatively simple, the diversity of species is not particularly high, and some food chains consist of few trophic levels. When examining the feeding relationships within an ecosystem, it is important to be aware of the distinction between a food chain and a food web. A food chain is a linear transfer of energy (in the form of food) from the autotroph (self-feeding organism) at the bottom, through the primary consumer, secondary consumer, and perhaps tertiary consumer at the top. Using the example of baleen whales, the food chain simply consists of phytoplankton → krill → whale: three types of organisms representing three trophic levels. Within the Southern Ocean ecosystem, a longer chain involves phytoplankton → krill → fish → penguin → killer whale. To complicate matters, some organisms may feed at different levels along the chain, such as penguins which eat both fish and krill. The food web, therefore, is a way of depicting the multiple food chains that exist within an ecosystem and the complex interrelationships between different organisms. Phytoplankton underpin the Southern Ocean food web by fixing the energy from the Sun into chemical energy. Although much of their biomass is consumed by pelagic (open ocean) organisms, some sinks down to the bottom of the ocean providing sustenance for benthic (bottom dwelling) organisms and the rest simply accumulates on the sea floor. As this happens, the carbon that was fixed through photosynthesis becomes part of the marine sediment. This is an important part of the global carbon cycle. In this way, the Southern Ocean is an important 'sink' for atmospheric carbon dioxide. The main consumers of phytoplankton in the Southern Ocean are zooplankton and crustaceans, such as copepods and krill. Antarctic krill is a shrimp-like crustacean, measuring about 6cm long, that dominates the primary consumer level in the Southern Ocean ecosystem. • Fish – e.g. the Antarctic cod. •Squid – Very abundant in the Southern Ocean. There are many species of squid and they can range in size from 15cm to over 15m in length. •Whales – Baleen whales such as the blue, humpback, fin, and minke have evolved mouths with fibrous plates instead of teeth that enable them to filter out huge quantities of krill from the ocean. During the main feeding season, a blue whale consumes about 3,600kg of krill a day! Whereas the blue whale is only numbered in the hundreds, the minke is by far the most abundant of the baleen whales today, with perhaps a million or so in the Southern Ocean. •Seals – The crabeater seal in particular relies almost exclusively on krill. The 'crab' in its name comes from the word 'krebs' in German which is a general term for crustaceans, not because the seal eats crabs! It is the most abundant species of seal in the world, and consumes more krill than all of the baleen whales put together. •Penguins– There are 17 different species of penguin (all in the Southern Hemisphere) but only five breed along the continent and/or the Antarctic Peninsula (emperor, Adélie, gentoo, chinstrap, macaroni). 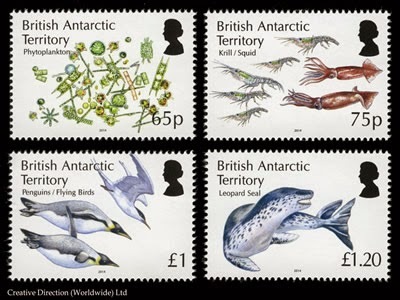 In the Antarctic, penguins (especially the Adélie) feed on krill as well as on fish and squid. Sheet Layout 65p, 75p, £1 & £1.20 in sheets of 10 stamps.